We spend a lot of time talking about the plants cats shouldn’t eat (tiger lilies, day lilies, and Easter lilies, for starters — lilies are bad, mmmkay? ), but what plants can cats eat? 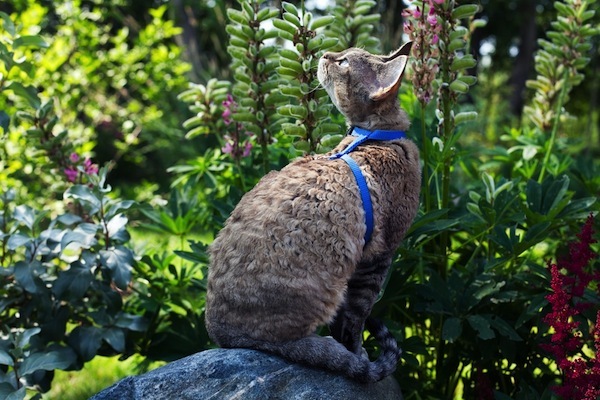 Are there any non-toxic plants for cats? Kitties are obligate carnivores, meaning they require a diet of meat, meat and more meat — so plants are just a fun, nutritionally void snack, kind of like that last box of Girl Scout cookies in your kitchen. It’s also possible that cats eat grass to help clear their digestive tracts of hairballs and other detritus — in other words, so they can barf it right back up. 1. Can cats eat catnip? Can cats eat catnip? Yes! And you can even grow your own catnip at home. Photography by gvictoria/Thinkstock. It’s super cheap and easy to grow catnip at home. All you need is a packet of seeds and a pot of soil, and before you know it your happy kitty will be able to get as stoned as her little heart desires. Catnip requires full sunlight, so you may need to keep it outdoors — and, naturally, out of reach of other neighborhood wanderers who might want a taste. Growing it in a container might be preferable, because this member of the mint family can be invasive. Most cats love catnip, and yes, it’s fine if your cat eats the catnip. 2. Can cats eat oat grass? Oat grass, typically marketed as “cat grass,” is on our list of cat-friendly plants. Simply plant the seeds in a pot (any size will do), and within a couple of weeks you’ll have a thick, luscious patch of greenery for kitty to enjoy. I typically leave the grass outside and bring it in every couple of days for Bubba Lee Kinsey and Phoenix to munch on. I do keep an eye on them, though, or they’ll eat the whole thing. 3. Can cats eat bean sprouts? These earthy little bits of roughage quickly add texture and crunch to any salad or sandwich — and in small amounts, they’re harmless to cats. If you want to hone your green thumb but know your kitty will devour anything you manage to grow, sprouts are a great way to get your fix and ensure your feline friend stays safe. 4. What kinds of herbs can cats eat? What herbs can cats eat? Photography by Vera / Shutterstock. In addition to bean sprouts, various herbs are also harmless to cats (in small quantities, of course; remember that cats are mad about meat, so plants are not a vital component of their diet). Valerian root, known for inducing sleep in humans, has the opposite effect on cats, causing your lazy kitty to get up and go (but it kind of smells like a foot). Many common herbs used for seasoning are also among cat-safe plants, including basil, dill, catmint, parsley and rosemary. Given the choice between herbs and grass, however, cats are more likely to choose grass, so keeping them side by side may discourage kitty from destroying your dinner plans. 5. What flowers can cats eat? 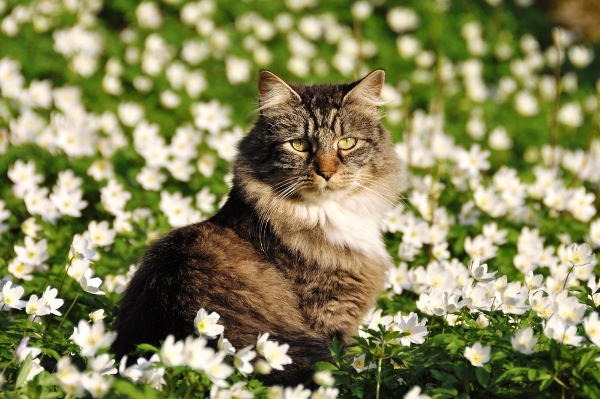 It might seem no bouquet is safe from your cats, but certain flowers are safe for your cats. Some options include roses, zinnias, gerber daisies, sunflowers, roses and snapdragons. Bad news: Tulips are potentially toxic! So are carnations, daffodils and — you guessed it — lilies. Keep these flowers away from your cat and call a vet ASAP if you suspect she ingested any of them. Thumbnail: Photography by HHelene / Shutterstock. I have been wanting to grow some bug repelling plants around the house like citronella, but am thinking I can’t now cause of kitty. Any suggestions? We suggest using non-toxic plants mentioned in this article. My cat loves to eat beans. But I only give in very small amounts. I read an online post saying that it is safe to feed cats some beans as a treat. I use Forti Flora over my cat’s food daily. It helps encou8rage her to eat.She is very finicky.It has a good flavor.I sprinkle 1/2 pack over wet food and add approx a tsp of water and mix it up. Forti flora is an excellent vet approved probiotic.I use it also on my cat who had pancreas issues. It has worked for her for almost two years,daily.She is 16 lbs,so I use an entire pack once daily instead of splitting a pack into two separate feedings. Dehydration as you probably know, becomes a big problem and other serious health issues. When my old cats were still eating some dry food, I’d switched them to a grain free, like Blue sweet potatoe and turkey, that sort of thing, but primarily wet food. It came down to whatever quality of life I could give them. Get whatever wet food the kitty will eat. Sometimes rescue places use chicken baby food but you need to make sure it’s the unsalted kind. I wish I’d consulted with more vets at the time. You really need their input. This is an older piece that we recently updated. We’ve since updated this piece to take lavender off the list. I guess we’ve been lucky. Over the last 32 years I have brought my wife a lot of flowers, ranging from fancy roses to grocery store mixed bouquets. We’ve had 2 or 3 cats all that time and never had one taste the plants. They do like catnip, though. Is it really common for cats to eat flowers? Practical style in general. The front part is actually a collar. But, when I properly adjusted it to the neck diameter, the top part become too short to place the back part in a right position. If I loose the collar it becomes too easy for cat to escape. Strangle fit in my opinion. Also buckles are very small and tight. Uncomfortable to open and close. Not for seniors, arthritis sufferes or those with manicure. :) All in all looks like somebody took a good idea but did not know how to make it right. Please do more research on the toxicity of oregano in cats. I have found several sources which discus the intestinal discomfort it causes as well as lasting liver damage. Thanks, Jeffrey. We will look into this for a future article. Some recently published houseplant guides include information on what plants are safe to have around pets, including cats. I don’t have dogs, and don’t know if they like to chew/eat houseplants, but my cats certainly do. Unfortunately, many popular houseplants are toxic. The ASPCA list mint as toxic, you list it is as safe. Could you clarify, please! Thanks for bringing this up! Mint is toxic to cats, but catmint is just fine. That’s updated! You are inaccurate about oregano as well. I’m not sure I would trust your information if you are not more careful about something so important. This is an older piece that we recently updated. We’ve since updated this piece to take oregano off the list. I didnt know geraniums were bad for cats. That is interesting. I always knew that Diffenbachia could be fatal for animals. But the list given was surprising to me. I also did not know that a felines diet “should” be purely meat based. That is not what we were told for many years. I would like some clarification on this so I know I am giving Mr Bear the best food possible. One of my biggest questions is this: why are so many cat foods now proclaiming to be “grain free”? Why is that important? I dont get it. I give my cat a urinary dry food (he has had a tendency to partial blockages – FLUTD-). I mix glucosamine in one of those smelly “lickable” treats every day, along with extra water, and for almost a year now, he has no further troubles with that. I wanted to let you know we live in FL and have a natural pet food store the owner was a zoologist at Miami Zoo. She wants people to understand the way to keep you cat healthy is for them to be fed raw meat but quality is extremely important. I have 3 cats tha are fed 90% raw Primal food. It is actually costing me the same as good quality dry food but I won’t be up against kidney stones all the other many feline problems. All I can say is a animal hunts for there food. Also my Shih Tzu is on Excalibur with Tripe raw food and he is healthy at 14 years old. Again much healthier then dry foods of any quality. I don’t know if that helps you. You can find companies online that can ship the food in dry ice. I have a freezer so I drive and stock up. Thaw the food and put in cube trays freeze and put in ziplocks pull out as needed. My cats are hooked on Primal Nuggets Beef And Salmon they eat a nugget in AM and PM each. I do have a high quality dry out for them but they eat very little of it.???? I use clump and seal cat litter for my Kitty. It is nice and sandy but not harsh on paws. I bought a plastic clear storage box for her cat box. 24″l x 17″w x 7″ h….. Works Great. It gives her plenty of room to dig and spend some time in her box with room for her business. Keep your cat away from geranium. I almost lost my cat Sammy Last Summer. He came so close to dying.